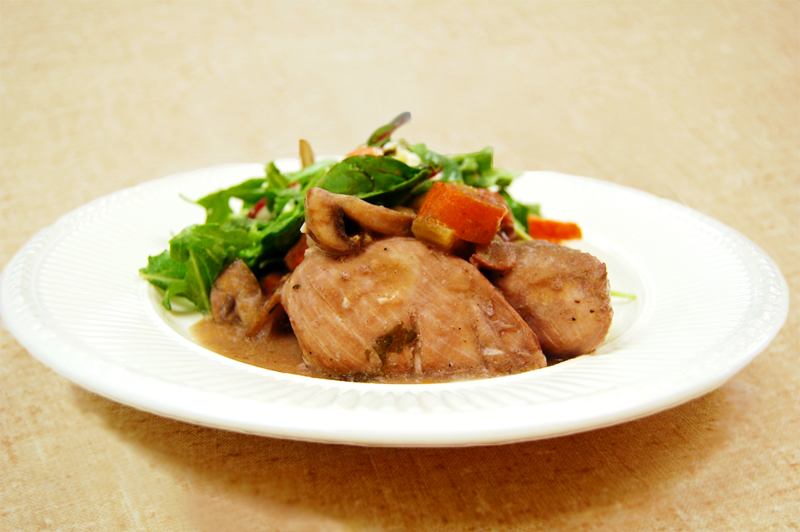 FROM THE KITCHEN: COQ AU VIN - Stahancyk, Kent & Hook P.C. 1. Season the chicken with a pinch of salt and pepper. Let rest. 2. Cut the celery, carrots, mushrooms and onions into stew-sized pieces. Sliver the garlic. 3. In a hot pot (medium-heat) add olive oil. Once the oil is heated, add the chicken and give it a good sear. 4. Add all the cut vegetables in once the chicken is seared. Season with the rest of the salt and pepper. 5. Add the parsley, thyme and oregano sprigs. 6. Once the pot is brought back up to heat add the bordeaux and chicken stock. Let reduce. 7. In a separate pan melt the butter and the flour to it making a roux. 8. Add the roux to the pot once the stock and wine have been reduced by half. Once thickened it is ready to serve.